Find it hard to play MP4 video on Xbox 360? If you have such questions, this article will help to solve your problem. At this page, you’ll know what kind of MP4 vidos are supported by Xbox 360 and how to stream unsupported MP4 on Xbox 360 for playback on Windows 10. 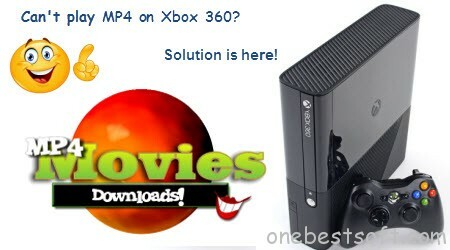 MP4 video format is so common for movie lovers, and surely it is one of the perfect sources for your Xbox 360 console. Unfortunately, so far Xbox 360 can not read or play all MP4s. To be frank, only two kinds of MP4 videos are playable on Xbox 360. Besides the above listed specifications, we must make sure MP4 is not larger than 4GB and is imported from USB storage device, Windows Media Player or Zune software. This app is outstanding with its super fast conversion speed, broad format support, helpful features and more. With its intuitive interface, you can easily and quickly convert your MP4 to output loss-less files with Xbox preferred codec or remux them to MP4 container in few clicks to make MP4 content watchable on Xbox 360 without considering its specification. What’s more, you can split/trim your MP4 movie files over 4GB for Xbox 360 and then copy trimmed movie/video files to Xbox 360 for playing. Now let’s set off our MP4 to Xbox 360 conversion journey on Windows 10. Step 1: Import MP4 movie files to the best Video Converter for Xbox 360. Launch Pavtube Video Converter Ultimate and click “Add video” to add the Xbox 360 unsupported MP4 files. You can also add files by dragging your MP4 files and dropping to the main interface of the program. Step 2: Select an output format for Xbox 360 and set the output folder as you need. Click on the dropdown menu of “Format” and then move your pointer to “Common Video”. From the sublist, the H.264, MPEG-4, AVI, WMV formats are compatible with Xbox 360. 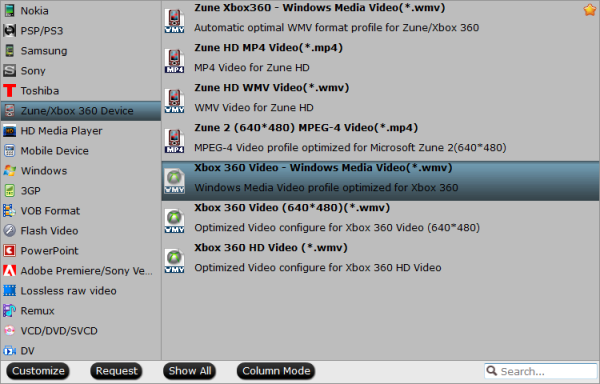 Of course, you can also choose the output format from “Zune/Xbox 360 Device”. From the sublist, the “Xbox 360 Video – Windows Media Video(*.wmv)”, “Xbox 360 Video (640*480)(*.wmv)”, “Xbox 360 HD Video (*.wmv)” are all the friendly formats for you to copy videos/movies to Xbox 360 for enjoyment. Step 3: Start converting your MP4 movies to Xbox 360. Tip: How to convert and trim MP4 movies more than 4GB to smaller files for Xbox 360? Set the Start time as 00:00:00:000, and then set the End time at the half time of the movie/video above for example 01:00:00:000. 2. Click “Convert” to move on the MP4 to Xbox 360 conversion. After that, you will be able to get the first movie part for Xbox 360 via clicking on “Open” button effortlessly. 3. Repeat the trimming, but this time you should set the Start time as 01:00:00:000 which is the End time you just set, and then set the End time as the whole movie/video time for example 02:06:10:130. Afterwards, click the “Convert” button to start converting and trimming. After the conversion, you can get the other second part of the video/movie. Now copy these two parts separately to your Xbox 360 for watching with high quality. 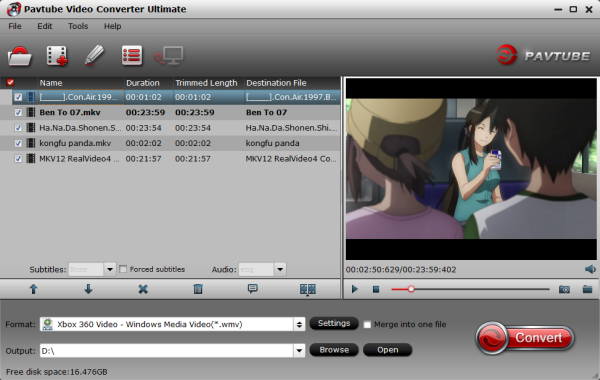 As a matter of fact, Pavtube Video Converter Ultimate is an all-in-one convert tool: Video Converter for Xbox 360, Blu-ray Ripper for Xbox 360 and DVD Ripper for Xbox 360. (Read comparisons).The most import that it’s the best tool for MP4 to Xbox 360 conversion. If you finish the whole readings from VideoHelp forum, it may take you at least half an hour. Then if you follow with them trying to convert MP4 to Xbox, it will take you twice or triple times. But using Pavtube Video Converter Ultimate, with one-click and a cup of coffee time (depends on movie length and quality), you can play watch MP4 on Xbox, so it deserves your try. Apart from MP4 to Xbox One re-encode, it enables you to convert between all mainstream video formats, including High Definition video MKV, M2TS, MTS, newly emerging H.265/HEVC, and regular video AVI, MPEG, WMV, MOV, etc.